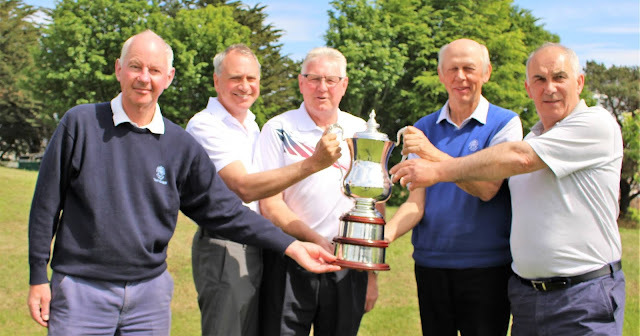 Left to right: Peter Saggers, Robert Smith, Hamish Simpson (captain of Elgin Golf Club seniors), Pat Tomisson and Walter Morris. Robert Smith, Peter Saggers, Walter Morris and Pat Tomisson, the same four players who gave Nairn Golf Club their first win of the B D Fraser Senior Northern Counties Cup competition at Royal Dornoch two years ago, won again in the final at Elgin Golf Club this morning, denying Cruden Bay their first victory sine the competition was inaugurated in 2002. It was a bitter disappointment for the Cruden Bay team of Jack Cooper, Geoff Reid, Steve Hutcheon and Dave Milne who saw their chance of extending the close final into extra holes dashed with vital putts holed and missed on the last green. Cooper and Reid were two behind to Nairn’s first pair ,Smith and Saggers, who had missed the final green with their approach while Reid had left Cooper with a 4ft birdie chance. Smith pitched well past the pin but Saggers holed the slippery downhiller for a 4, leaving all the pressure on Cooper. His putt slipped slipped past the hole and the half left Nairn at two up. The second string pairings saw Tomisson and Morris go down by one hole to Cruden Bay's Hutcheon and Milne, not enough to cancel out Nairn's lead from the first-string tie. R Smith and P Saggers 2, J Cooper and G Reid 0.